For all those that missed our courageous session with Museum Studies’ ‘The Attic’, or for those of you who want to scrutinise our choices further, here’s a rundown of our selection process and the artefacts that made it into our ‘History of Leicester in 10 Objects’. We deliberately avoided objects that simply illustrated existing (social) histories of the city. The objects, as evidence, were very much the starting point of our deliberations. We also aimed to provoke discussion on the relationship between material culture, its uses and, perhaps, abuses in the study of history. A central site of our analysis was ‘materiality’. We worked with the definition that materiality referred to the physical properties of an object and its agency; its impact on human actors and its role in social interactions. The group also agreed that in the act of interpreting these objects for our History of Leicester the boundaries of these ‘things’ were not always self-evident or fixed. Therefore, although we divided our 10 objects into three broad categories: ICONS, URBAN LANDSCAPE, THINGS WHICH AREN’T -some of the objects we chose could fit into more than one of these categories depending on your interpretation. A subtle reminder of Leicester’s period under Danish Law in the 9th century. The city became one of five fortified towns important to the Danelaw. The image of the Vikings as we know them today was mostly created by Victorian Britain. This head decoration is a good example of this mythologized figure, which became popular across the English-speaking world. In 1858 Leicester was a growing town. Municipal reforms in the 1830s brought in a borough council dominated by the Liberal Party. It was also a time of growth, of rapid population increase, of railways and growing transport networks, of houses and factories and breweries. In this same year an unknown Tiger in an unknown land lost its head and was made into a snuffbox for the officers of the 17th Leicestershire Regiment of the Foot. Their symbol is the ‘royal tiger’ – a green tiger with its front paw raised, taken from a standard of the Gurkhas captured in the Nepal War of 1815. 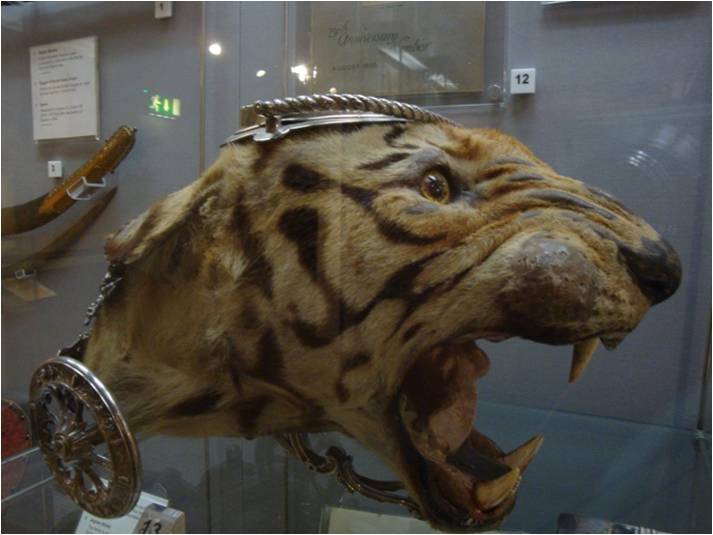 To add insult to the tiger’s injury, not only was it dead, stuffed and a snuff box put into its head, but it was also placed on tiny wheels. A fearsome animal reduced to a plaything of the army, to be wheeled across the dinner table amidst, I imagine, much amusement. Little is known about the Tiger’s career before it became a snuffbox. The army’s whereabouts in 1858 are as much of a mystery (to me) as is the provenance of the tiger’s head. Back then the Tiger’s head seemed to symbolise the triumph of man over nature; the triumph of Europe over a barbaric, primitive world as Britain sought to dominate the globe, exporting its ‘civilisation’ and culture to its colonies in exchange for great wealth and power. Today the Tiger’s head seems less exotic than perhaps it once did, perhaps even a symbol of past glory. Now the tiger seems to stand for Leicester’s familiarity with difference; a legacy of Empire and colonies is its diverse population – for Leicester city council its cultural diversity is the city’s “defining characteristic” – the city, a former Roman military settlement, which has benefited from conflict and oppression in the past, now strives to be a place where people of all cultures, ethnicities and faith can live in peace. In a time of political rhetoric that supports the failure of multiculturalism, the rise of the British National Party and English Defence League, in a time when we are facing economic problems and questions over social welfare, the symbol and narratives that the Tiger represents seem to me to be more important than ever. It is up to us to decide what stories we want to take from the past and into the future. Joseph Merrick, known to many as The Elephant Man, was born and raised in Leicester. Many of the narrow streets of Merrick's time remain. Nearby is Lee Street, the Merricks’ first home after their marriage. Upper Brunswick Street was the location of their second home, and Russell Square was where Joseph's father ran his haberdashery business. The Merricks’ later tenement homes were in Birstall Street and Wanlip Street, and Lower Hill Street was where Joseph Merrick found his first employment soon after his twelfth birthday, rolling tobacco for a cigar maker, until his deformities grew to impede even this limited earning ability. 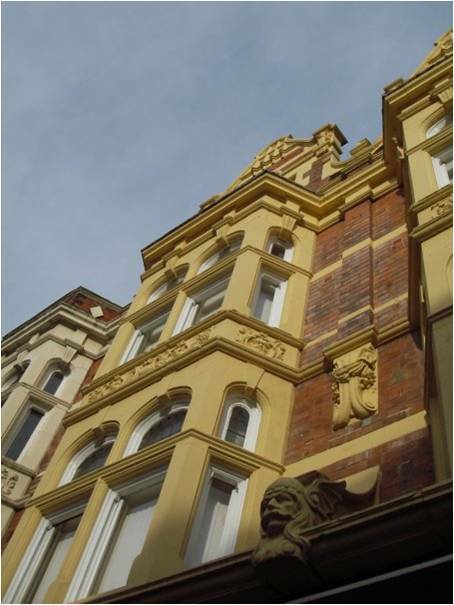 The Hippodrome Theatre on Wharf Street was the last building to have a physical link with Leicester's Elephant Man. It was here, so far as we know, that he was first exhibited to the public, after having run out of other options to maintain his financial independence. On May 15, 2004, a plaque was unveiled on its side wall to commemorate his life. Not an official memorial, it was privately commissioned by the Friends of Joseph Merrick group. The plaque mysteriously disappeared, in 2008, and the theatre was demolished in March 2009. With these went the material traces of Merrick’s memory. It turns out that the plaque was taken down by property developers who demolished the theatre and planned to build a block of flats in its place. Representatives of Launch Padz developments, which had been keeping the plaque safe, returned it to the Friends group, who will keep it until the new development on the site is completed. And yet, I can’t help but wonder: shouldn’t the Council have commemorated this heritage? Shouldn’t it have stopped the heritage from being destroyed in the first place? Or is this a local preview of life in David Cameron’s Big Society, where private interests for preservation and development play cat and mouse with material culture? The history of Wygston’s House demonstrates the changes in Leicester’s industry and infrastructure, and also its changing priorities for civic engagement. 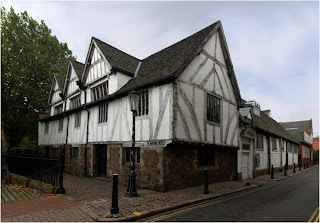 Wygston's House is the best-preserved medieval half-timbered wattle-and-daub house in Leicester and was probably built in the 15th century. The front of the half-timbered hall has a long range of windows. These ground-floor windows once housed twenty-eight panels of painted glass which survived the iconoclasm of the Reformation only to be removed in 1824. The house was probably saved from development by virtue of the fact that an impressive Georgian house was built in front of it. Wygston's House was thus unnoticed for many years; even now, you must peer over a fence to glimpse it. Eventually it was acquired by the City Council, and operated until comparatively recently as a Museum of Costume. However, the building was found to be unsuitable for its purpose, and the collection was dismantled. Most of the costume can now be found at Snibston Discovery Park at Coalville, which is run by the county council, though some elements formerly on display, like the 1920s draper’s shop, have been reincorporated into other Leicester City museums and collections. The house is no longer used as a museum, but meetings and seminars are still held there. Ghosts, including a crying child, have been sighted in the house, and it is a popular venue for ghost walks and vigils. The museum itself is a kind of ghost. What should it be in the future? We’re just supremely happy it’s not closing because of the cuts! Please visit!! Established in 1849 (and incidentally opened on the same day as New Walk Museum) WRC is Leicester’s oldest municipal cemetery, and is still in use today. While it exists, in a sense, as a collection of objects, it might also be considered an ‘object’ in its own right in its capacity as an ‘evolving cultural landscape’ whose use has changed over time. 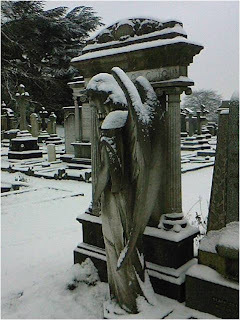 The Cemetery is a key witness to the history of Leicester. Far from being simply a place of stasis and decay, the cemetery is bound up with the life of the community and has seen a great deal of change from its inception, both within as well as beyond its borders. Crucially, many of the people who helped shape Leicester as it stands today, both figuratively and literally, are buried here. For example, Isaac Barradale (1845 – 1892), who today is considered one of Leicester’s finest architects. He built many of the houses in Stoneygate and popularised what became known as the ‘English Domestic Revival’ style of architecture. In turn, the people of Leicester have chosen to shape the Cemetery. One of the biggest alterations to the Cemetery came in 1958, when the two Gothic chapels (one for Anglicans and one for dissenters), along with the Registrar’s lodge, were demolished as unsafe. The loss of these buildings, particularly the chapels which provided the architectural centrepiece of WRC, was keenly felt and inspired an interesting project at the time of the large-scale restoration of the Cemetery in 2004,which saw the construction of 100 memorials commemorating citizens of Leicester laid out in the shape of the space once occupied by the chapels. Thus we may see that WRC is not the place of stagnation it at first appears, but is deeply entwined with the story of Leicester; its tombs and layout bear witness to the architectural, spatial and personal predilections of past generations of citizens, and as such it might even be considered a kind of microcosm of the larger city. Changing street names of Leicester are a mixture of tangible and intangible – as street signs can be physical objects (signs, etched into kerbs or buildings) but their names can disappear, change or otherwise become corrupted. While helping to shape one’s knowledge and perceptions of a physical place, itself subject to change, they can also mislead and misdirect us, refer to vanished buildings, individuals, lost or forgotten objects and ways of living. Some of Leicester’s more ancient streets have changed their names several times, often as the nature or purpose of the route has changed. ‘Cank’ Street in Leicester is a good example of the tendency of street names to refer to both tangible and intangible things. The street was the site of ‘The Cank’, a medieval communal well, but ‘to cank’ also meant ‘to gossip’ in the local dialect as those waiting to draw water would catch up on the latest news. Thus we may observe how a street name can refer us to intangibles such as oral and linguistic histories. Street names in Leicester, as elsewhere, were often used to commemorate persons and events, but they were also used to obliterate them too. During and after WW1, many of Leicester’s more Teutonic-sounding street names were altered to sound more ‘English’, (the irony was not lost on some of Leicester’s citizens) and so Hanover Street, Saxe-Coburg Street and Bismarck Street became Andover Street, Saxby Street and Beaconsfield Road. It was hoped that giving these streets a new identity would help the recent past to be forgotten, although during WW2 Saxby Street along with Highfield Street suffered the city’s worst direct hit from an incendiary bomb, which killed 40 people. Arguably, then, this street is still a monument to the memory of war. Street names of Leicester constitute not only a fascinating palimpsest which documents the shifting map of the city, but demonstrate how a street name can serve as a metonym by referring to concepts beyond and much larger than themselves, such as the changing use of language, the construction and erasure of memory and changing perceptions of collective identity in Leicester. In ‘The Storyteller’, Walter Benjamin astutely observed that storytelling is primary amongst the arts of memory. It is often thought that humanity has a fundamental need to create stories, to use them to explain the world around them and their situation within it. Whether these stories are true or not is beside the point, for it is in giving meaning and explanation to the world in which their value lies. These stories are often vitally important in local identity and history –so important, in fact, that they are enshrined in physical form in various ways. In this copy of the county folklore, there lies the story of Black Annis, who was a fierce, blue-faced witch who haunted the Dane Hills just outside Leicester. She pops up in a number of records, and in a number of places around the town such as the Turret Gateway on Castle View, in local guided tours and talks, as well as in various forms in popular culture more widely. By discussing the intangible folklore of Black Annins alongside the tangible records of her and her wicked ways, we are forced to consider what version we believe to be truth. The Black Annis ephemera provides metonyms, parts of the other object which is never fully there, that myth, that story, that exists once and once only, is new in every telling. This object is not what you think it is. It tells us certain things about the event (the Leicester Pageant) through itself –the dates between which it happened, the cost of the script, the route the pageant procession took, the people who organised and sponsored it, the period of time it covered, and (with a nod to chronological complexity and layering) the attitudes of the people of Leicester regarding the historic events of the city and county. However this description doesn’t reveal the full extent of the script’s status as historical evidence. 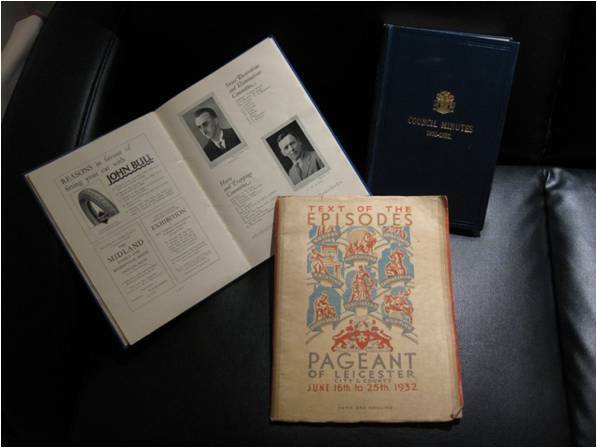 Alongside contemporary film taken of the pageant and Council Minutes of 1931-32, it is possible to see echoes of these materials in each other. The Pageant Song is repeated in both programme and script, each of these contain photographs of the scenes which were enacted in the film, and the council minutes contain the names of the organising committee, whose photographs appear in the programme text. Whilst we can see this script as a material being in its own right, it might also be conceptualised as part of the pageant of almost 80 years ago, an object so fleeting, so ephemeral, that its existence is now limited to ghosts in paper, film and memory. What I want you to take away from this is the idea that objects are not singular and bounded, nor are they always the object in question, but part of its surrounding paraphernalia. We need, therefore, to recognise the multiplicity of the things we look at –we need to look at them as what they are not. The object wasn’t what you thought it was, was it? Leicester’s non-monorail only existed in Konrad Smigielski’s Leicester Traffic Plan (1964). However, just because it was never built is not to say it never happened. The monorail was planned to operate on a north-south route between Beaumont Leys and Wigston with the Clock Tower as the centre-point. It was invented to sit alongside electric ‘rickshaw-style’ taxis and pedestrian conveyor belts, as part of Smigielski’s vision for Leicester’s city centre, as a place for sociability, pleasure and consumption. I think there is value in rehabilitating the non-monorail from the dustbin of history, especially because it is embedded in an iconic ear of planning and architecture which has often been vilified in more recent decades. Unlike the folklore of Black Annis, or the Pageant of 1932, the monorail does not exist in memory as a past event, but it does have a place in our imagination. The material power of the non-monorail is its instantly recognisable status and easy location amid the affluence and optimism of Britain in the 1960s.